NEARLY 1,300 incidents of paramilitaries forcing people from their homes were reported in Northern Ireland over the last three years, The Detail can reveal. The level of intimidation attributed to paramilitary groups vastly outnumbered the cases of homelessness that were blamed on racism, sectarianism, homophobia or anti-social behaviour. Figures obtained from the Northern Ireland Housing Executive list homelessness cases that were caused by various forms of intimidation from 2012-15, showing that 70% of the 1,842 cases were linked to paramilitaries. We showed the data gathered by The Detail to Lord Alderdice, who was a leading member of the Independent Monitoring Commission (IMC) which reported on paramilitary activity for the British and Irish governments from 2004-2011. He responded to the figures by raising concerns over the scale of paramilitary intimidation at such an advanced stage of the peace process. "The sooner we can find a way of working through the unfinished business of addressing the terrible legacy of the past, the sooner our people, especially those in working class areas, will be freed of the shadow of gunmen and gangsters," he said. The former Alliance Party leader said a series of factors indicated that "the peace process is stalled", adding that "there is 'unfinished business' that needs to be addressed." The Housing Executive reviews all cases presented to it. Some alleged victims may eventually seek housing elsewhere, while in other cases it is not possible to secure evidence of a paramilitary threat. But the figures show that in nearly 900 of the cases where paramilitary intimidation was reported, the Housing Executive was obliged to seek new accommodation for individuals deemed to be at risk of death or serious injury if they returned to their homes. Information on the identity of the paramilitary groups linked to the intimidation is not recorded in the data and the Housing Executive said it had no information on "the origin of paramilitary threats". Charts compiled by The Detail suggest that areas which are mainly unionist or loyalist have seen the highest figures for the reporting of paramilitary intimidation. However, the Housing Executive said that it cannot be assumed that the area in which people present as homeless is necessarily the area in which the intimidation took place. The figures do illustrate a high level of paramilitary intimidation across Northern Ireland. A spokesperson for the Housing Executive said: "We have a statutory duty to provide housing for people who find themselves in this situation and this does provide further pressures on limited resources and social housing. "The Housing Executive has had to directly deal with the consequences of community conflict in Northern Ireland since it was created in 1971. "It is obviously very concerning that in 2015 many families are still coming to us for help because they feel insecure in their own homes." The data obtained by The Detail reveals that from 2012-15 there was an average 430 cases per year of people reported to have been forced from their homes by paramilitaries. There were 1,842 cases where people presented as homeless due to various forms of intimidation from 2012-15. In 1,292 of the cases, representing 70% of the incidents, the reason given was paramilitary intimidation. Racism was blamed in 122 of the cases, sectarianism in 166 of the cases, and intimidation linked to sexual orientation was blamed in 48 of the cases. Anti-social behaviour was reported in 214 of the cases. There were fewer than ten cases of intimidation linked to disability, but the exact figure is not included in the data to avoid identifying any individual. When people 'present' as homeless due to intimidation, the cases are subsequently reviewed to see which should be categorised as 'full duty applicants'. The Housing Executive said: "This is a person to whom the Housing Executive owes a duty under Article 10 (2) of the Housing (NI) Order, 1988 to 'secure that accommodation becomes available for his / her occupation'." There were 1,222 cases subsequently categorised as full duty applicants. Paramilitary intimidation accounted for 897, or 73%, of the cases. Some cases do not become classified as full duty because the people involved move away, or take-up private accommodation, or circumstances mean that it is not possible to find the information to substantiate a report of paramilitary involvement. The incidents of homelessness linked to intimidation include people who were living in private as well as public housing, but they appear in the Housing Executive data when they turn to the social housing agency for help or advice. A Housing Executive spokesperson said: "Dealing with cases of intimidation does put additional pressure on social housing." WHERE DID THE PARAMILITARY INTIMIDATION TAKE PLACE? Exact locations for the incidents of intimidation are not released by the Housing Executive to avoid identifying victims, but the records do give broad indications as to where cases were reported. The Housing Executive has 13 areas of operation across Northern Ireland, most of which match the new network of 11 local councils. It also runs a Homeless Service Unit (HSU) in the centre of Belfast. 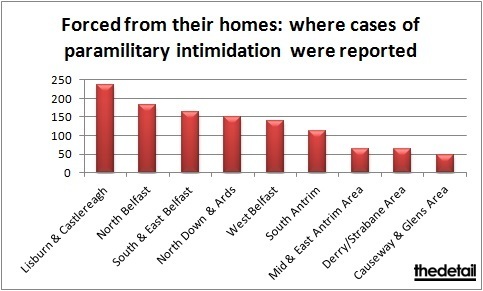 The chart above, compiled by The Detail, shows the areas with the highest number of paramilitary intimidation reports. The table does not include four of the Housing Executive’s areas, or its HSU office, as the relevant data was either too low, or because exact figures were withheld to avoid identifying individuals. The figures show the locations that recorded the bulk of paramilitary intimidation claims. Lisburn and Castlereagh area, where there were 236 reports of paramilitary intimidation forcing people from their homes. North Belfast with 182 cases. South & East Belfast recorded 163 cases. North Down & Ards had 151 reports of paramilitary intimidation. West Belfast recorded 140 cases. South Antrim saw 111 cases reported. Of the remaining areas the 'East' region, which broadly covers the Mid and East Antrim Borough Council area, and the 'West', broadly covering Derry and Strabane District Council area, both saw 63 cases. The Causeway area, broadly covering the Causeway Coast and Glens Borough Council, saw 47 cases. Other areas recorded around ten, or fewer, cases. WHICH PARAMILITARY GROUPS ARE TO BLAME? The chart compiled by The Detail that lists the location of paramilitary intimidation allegations suggests most cases were reported in areas that are mainly unionist or loyalist. Locations where republican paramilitaries may be active also figure among the statistics. However, the Housing Executive indicated that definitive conclusions cannot be drawn on the basis of where cases were reported. "We cannot provide information regarding the origin of paramilitary threats as this is not recorded," said the Housing Executive. "Also, we can only provide geographical statistics based on where the applicant presents, not where any alleged attacks took place. "Given that many households experiencing intimidation will flee the area from which they are intimidated, the office they present to cannot be assumed to be their local office." It is noted, for example, that between 60 and 70 cases of paramilitary intimidation were reported over the three year period at the Homeless Service Unit in the centre of Belfast where individuals who have no address in the city can present as homeless. "The Housing Executive records intimidation reasons for statistical purposes only,” said the housing body. "When choosing a reason category the Housing Executive takes account of the information available to it at the time of recording. The organisation added: "Where more than one category is evident the Housing Executive will choose what appears to be the primary category of intimidation." The ceasefire of 1997 by the Provisional IRA (PIRA) was followed by the signing of the Good Friday peace agreement in 1998. But it was not until 2005 that the IRA decommissioned its weapons and formally announced the end of its campaign. 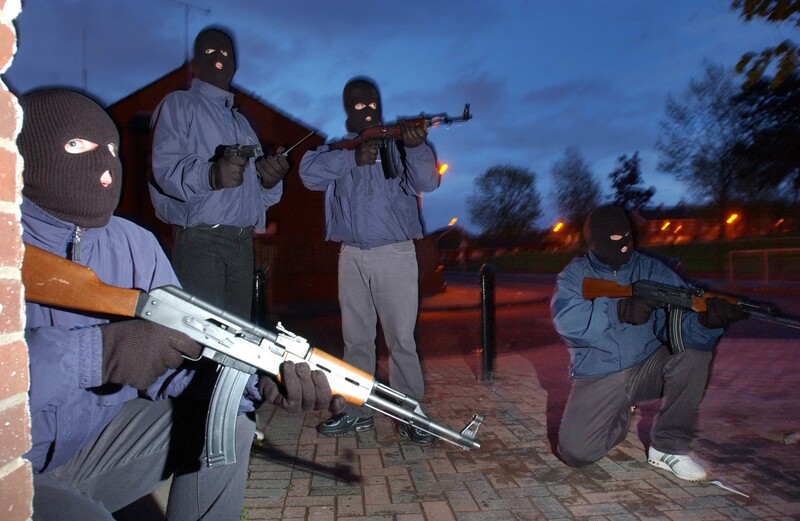 In 2009 the loyalist paramilitary Ulster Volunteer Force (UVF) and Red Hand Commando decommissioned weapons. In 2010 the loyalist Ulster Defence Association (UDA) decommissioned, as did the republican Irish National Liberation Army (INLA) grouping. Despite the decommissioning of weapons, the new statistics for intimidation demonstrate that other forms of violence have continued among some paramilitaries. In its final report in July 2011 the Independent Monitoring Commission (IMC) cited concerns over violence by dissident republicans opposed to the peace process. Dissidents today remain an ongoing threat. The IMC report of 2011 predicted that: "Members and former members of all paramilitary groups remain very active in non-terrorist types of crime – a bequest from the Troubles which will dog Northern Ireland for years and will require a substantial continuing effort from law enforcement agencies." The commission added at the time: "One striking feature of the changes we have described has been how PIRA, however slowly, transformed itself under firm leadership and has gone out of business as a paramilitary group while loyalist groups, lacking comparable direction, have struggled to adapt." While the peace process has been in operation for decades, the figures obtained by The Detail point to the continuing level of paramilitary intimidation. Lord Alderdice indicated that the levels of homelessness also underlined the continuing human cost of such violence. He told The Detail: "These figures demonstrate what we have always known - that the people who suffer most from the presence of paramilitaries are those in the communities that they claim to represent. "The sooner they are stood down permanently the easier and better life will become for ordinary people in republican and even more especially loyalist communities." He added: "Many people, and to be fair this includes some in the paramilitary groups, have worked hard to address the problems, but others are trying to maintain criminal networks for their own benefit." 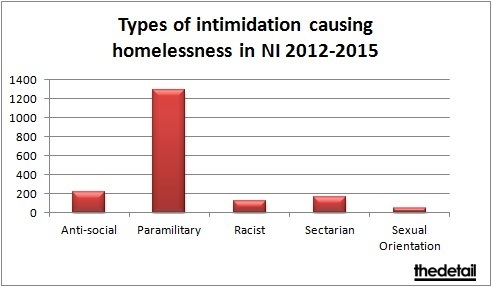 Figures obtained from the Northern Ireland Housing Executive, list homelessness caused by various forms of intimidation from 2012-15, but 70% of the 1,842 cases were linked to paramilitaries. Lord Alderdice, a leading member of the Independent Monitoring Commission (IMC) which reported on paramilitary activity for the British and Irish governments from 2004-2011, raised concerns at the scale of violence at such an advanced stage of the peace process. The former Alliance Party leader said a series of factors indicated that "the peace process is stalled", adding that “there is `unfinished business’ that needs to be addressed." Information on the identity of the paramilitary groups linked to the intimidation is not recorded in the data and the Housing Executive said it had no information on “the origin of paramilitary threats”. The Detail compiled a list of the areas where the highest figures for paramilitary intimidation were recorded, showing most were in areas that are mainly unionist or loyalist. But the figures do illustrate a high level of paramilitary intimidation across Northern Ireland. :: There were a total of 1,842 cases where people presented as homeless due to various forms of intimidation from 2012-15.
:: In 1,292 of the cases, representing 70% of the incidents, the reason given was paramilitary intimidation. :: Racism was blamed for 122 of the cases, sectarianism for 166 of the cases, and intimidation linked to sexual orientation was blamed for 48 of the cases. :: Anti-social behaviour was blamed in 214 cases of people presenting as homeless. There were fewer than ten cases of intimidation linked to disability, but the exact figure is not included in the data to avoid identifying any individual. The Housing Executive reviews all cases presented to it. Some alleged victims may eventually seek housing elsewhere, while in other cases it is not possible to secure evidence of a paramilitary threat. But the figures show that in nearly 900 of the cases where paramilitary intimidation was reported, the Housing Executive was obliged to seek housing as the individuals were deemed to be at risk of death or serious injury if they returned to their homes. Lord Alderdice said: "These figures demonstrate what we have always known - that the people who suffer most from the presence of paramilitaries are those in the communities that they claim to represent.